:: Question of the Day: What the heck are Peptides? Well, finally - after two years of waiting - I am in my new room! It is so cool. I hope you will find this room even more relaxing and more comfortable than my former room. Thank you to all of my friends who helped me make this an awesome sanctuary. Since I've rearranged my digs, I also thought we should rearrange the newsletter a little. Starting this month, you'll find the Question of the day and the Pamper Yourself at Home sections moved to the top of the newsletter. My service and product offerings are now below that. It's important that you know what specials I have this month (and I know that you will scroll all the way down to see! ), but I want this newsletter to be informative, too, and that should come first. If you have a question you'd like me to answer in the newsletter, please email me at nicole@raspberrymoonst.com. Ovarian Cancer is the Deadliest of the Gynecologic Cancers. This year, more than 20,000 women will be diagnosed with ovarian cancer. More than 15,000 American women will die from ovarian cancer this year. That's a 75% mortality rate. Until there's a test, awareness is best. Early detection can improve survival rates from 25 percent to over 90 percent. Be alert to changes in your body. For more information and the signs to look for, check out http://www.scovariancancer.org. During the month of September, I will be donating all proceeds from my Eye Candy Treatment to the SC Ovarian Cancer Society. Call me to add this to a facial and help women with this deadly disease at the same time! 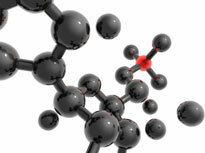 Question of the day - What the heck are Peptides? From www.wrinklereview.com: Peptides are short chains of amino acids. Amino acids are the basic building blocks of proteins and many other different types of organic molecules. Peptides are frequently created by the digestion of proteins in the body, and many types of peptides are readily and rapidly absorbed by the bloodstream. For this reason, peptides are particularly effective as skin care ingredients. Many peptides work as hormones, neurotransmitters and as natural pain relievers. There are several different peptides, but below are a few that you will likely see. The main idea to remember is that peptides work as an anti-aging treatment. Also, remember that the ingredients are listed from most used to the least, so if the peptide is the last ingredient on the list, then the strength is not going to be very high. Acetyl Tetrapeptide-5 - Designed to reduce puffiness, great for around the eye area. Dipeptide Diaminobutyroyl Benzylamide Diacetate - A new anti-wrinkle active compound, a synthetic tripeptide, that will help to smooth the appearance of wrinkles by relaxing the underlying muscle working along neural pathways. Palmitoyl Oligopeptide - A tripeptide enhancing the production of collage. It is clinically proven to regenerate the skin's upper layers by strengthening and thickening the epidermis. It helps to stimulate hyaluronic acid production, thus it helps to also reduce skin roughness and depth of wrinkles. Palmitoyl Tripeptide-7 - Deep-penetrating amino peptide mimics the body's mechanism to produce collagen. It is a clinically proven safe and effective anti-wrinkle treatment, excellent for the neck and to treat stretch marks. Copper Peptide - Studies have shown that copper peptide promotes collagen and elastin production, and also acts as an antioxidant. It helps to firm, smooth, and soften skin. Pentapeptides - These peptides are great for strengthening the skin. Matrixyl 300 - Is a firming and repairing peptide complex, a blend of palmitoyl-tripeptide and palmitoyl-oligopeptide. Here are some quick tips for at home eye remedies. Instructions: Brew green tea, steep, chill. Slice cucumber and add to green tea. Refrigerate until cool. Place soaked cucumber slices over eyes for 10 minutes. Instructions: Chop parsley finely, mix into sour cream. Place half of mixture into the middle of each square of cheese cloth, fold into "pillows," put one on each eye for 10-15 minutes. Paige Floyd with Colorescience will be here wielding her magical wand and making us all look younger! Paige will just be focusing on the eyes and introducing our new Optical Illusions concealer/anti-aging stick, and several new eye color items. There will be several gifts with purchases, a percentage off all other Colorescience items and several other specials. We'll have refreshing drinks and snacks to tide you over as well. So be sure to mark your calendars and get your looked jazzed up for Thursday night party night! Experience an eye lifting event with our Eye Candy Treatment. Top of the line products will be used to enhance your eye area. After gently cleansing, we will hydrate the eye area with products designed by Colorescience to hydrate, rejuvenate and lessen lines. An intense fleece mask will also be added and then we will finish with Caniglia Skincare Ultra Rich Eye Cream, which is packed full of peptides, and finish with the new Optical Illusions Correct and Colore pens. The Eye Candy Treatment is regularly $15 with any facial. Through the month of September, our Eye Candy Treatment will be $10 with any facial, and all the proceeds go to The SC Ovarian Cancer Society. Colorescience has done it again, by creating another first in the "good for your skin" colore category. Realizing the need for beauty and camouflage qualities, Optical Illusion Colore-Corrector Pens are formulated to address both challenges. Our Colore~CORRECTOR Pens work aesthetically as concealers using luminescent light pigments to reflect and refract light, leaving the eyes looking bright, smooth and rested. With the addition of a tri-peptide blend and chocolate extract, the appearance of fine lines, dark circles and puffiness is improved. COLORE~Corrector Pens are perfect to partner with our Correctors or to use as a stand alone product. Created with a new patented "colore shift" pigment, they give the illusion of backlighting that is changing colores right before (and on) your very eyes! It wouldn't be Colorescienc e if it was all beauty and no benefits, so these too contain tri-peptides and chocolate extract. For an everyday casual look, just smudge it on and use the sponge tip applicator to gently blend. Press and pat! It should look a little "undone." For more formal occasions and for use on lids that are aging, use your Optical Illusions first to give you definition, then use one of the Genie colores to gently and carefully smooth over the other colore. This will soften the lines and the look of other products... and add more dimension! Tri-peptides to reduce the appearance of fine lines, dark circles and puffiness! 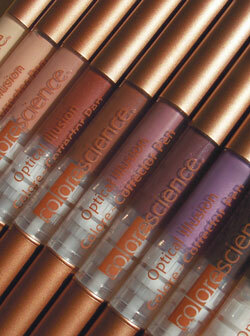 Optical Illusions Colore-Corrector Pens allow you a vast array of beauty and camouflaging options. Packaged in the pretty pen with a sponge tip applicator, you are just a twist away from experiencing mineral magic! I am in town again the whole month of September!